Norah, Karen, and Romi expressly designed pieces worn by novel's four primary characters. Clea's knitting is magic, literally. She's also a cashmere goat farmer, and any of the five patterns would work up beautifully in that luxe fiber, as well as in merino, alpaca, and a spectrum of other fibers. Why a knit collection based on a novel? 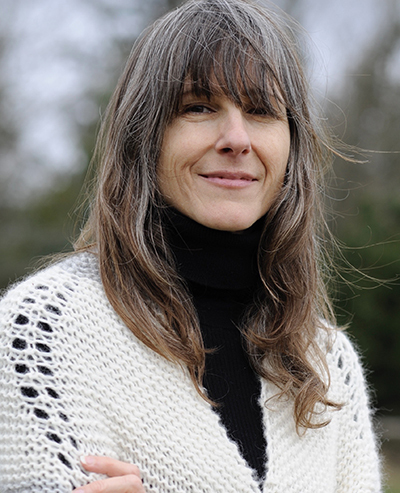 My protagonist, Clea Reese, is a passionate knitter and animal lover. Because of my love of knitting, Iwanted to turn her imaginary knit creations into real ones. Clea is pursuing her mentor’s murderer, so she dons Karen's stylish, yet cozy vest for the cold New England winter. 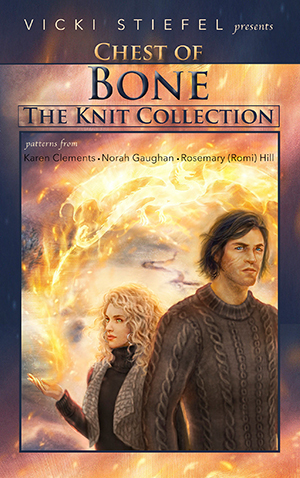 Norah's sweater echoes the bold and complex facets of James Larrimer, a compelling man with a haunted past and a deadly mission, while Clea's foster mother, Bernadette, is seldom without her shawl, designed by Romi. In the novel, Clea decides Larrimer needs a pair of half-fingered mitts, so she knits them up, while also crafting a fingerless pair for her teenaged charge, Lulu, a girl she loves deeply. Both mitts patterns were created by Rosemary.